Home food	Who makes the best luxury hot chocolate? Who makes the best luxury hot chocolate? One of the best things about cold winter days for me is drinking a mug of hot chocolate. For years I tried to get used to the taste of coffee and then realised that some people spend years trying to give it up, so instead I have become a hot chocolate connoisseur and forced everybody else to embrace my wicked and decadent ways. Hotel Chocolat produce the most expensive chocolate we tried. Each tin costs £10 and we decided to mix the Salted Caramel and regular flavour to create our own (very nice) blend. Inside the tin are crumbly chocolate flakes which you combine with hot milk to make the drink. It’s quick to make and tastes very good, but the high price would put me off buying it again, although it would make a lovely gift and a nice change from a box of chocolates. 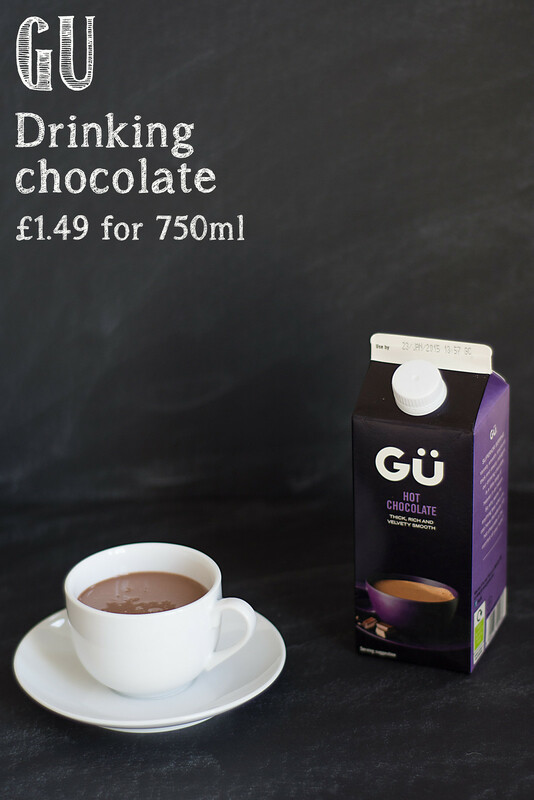 Gu Hot Chocolate has been recently launched and comes in liquid form in a carton ready to be heated. There’s enough for several cups and it’s a lovely luxury treat, but not something I can imagine drinking often. As you would expect from a brand known for their delicious puddings if this hot chocolate was a tiny bit thicker it would actually be a chocolate sauce and the kind of thing you could imagine pouring over a sponge pudding or vanilla ice-cream. This was our favourite of the four we tried, but as a liquid drink it also has the shortest shelf life (2 weeks unopened) which means it’s not a practical option to keep for the occasional drink. Gu also produce a Mocha flavour and Salted Caramel. 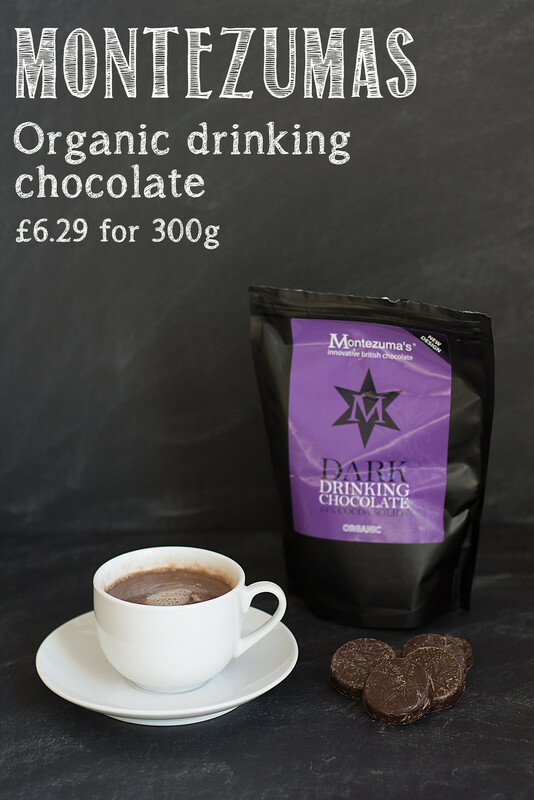 Montezumas are based just down the road from me and make some wonderful chocolate products. Their hot chocolate drink comes in solid chocolate tablet form. One tablet is enough for one mug of drink. The instructions advise you to heat the milk in a saucepan and then add a little to the chocolate tablet and stir continuously to mix the two. As you can imagine it’s not a speedy process and the solid form in which the chocolate comes means it’s a little restrictive for making smaller servings. We did however very much like it’s authentic unsweetened chocolate flavour and felt that the chocolate tablets added a certain amount of “theatre” if you wanted to serve the drink to guests. Montezumas also make a chilli, mint and mochachino version of the drink. 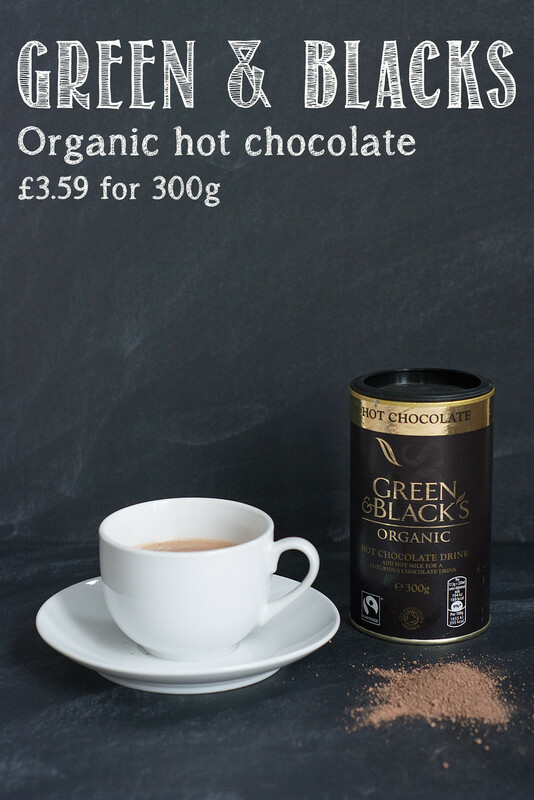 Green & Blacks was the cheapest of all the brands we tried and out of the three store cupboard options it was also the easiest to prepare. It is sold in a conventional cardboard pot with plastic lid and is in powder form. It’s main difference from cheaper rivals is that the flavour is less sweet and more chocolatey. As much as I wish our results came out in favour of a smaller chocolate company, for convenience and price this was our winner and an overall second behind Gu’s liquid drink. Are you a hot chocolate lover? Let me know your favourite brand in the comments below…. I Quit Sugar… and then what happened? oooh I love the look of that Gu one. I made my own at Christmas with cocoa, icing suger, cinnamon, grated chocolate and a tiny dash of flour to thicken it. It’s Charbonnel & Walker every time for me. Lovely chocolate flakes that melt so easily. Now you mention it that is the obvious 5th option I should have tried – never mind! I am not very keen on chocolate drinks, too rich for me,but I love chocolate, especially milk and white. Hotel Chocolat is doing great things for chocolate. They have their own cocoa growing plantation in St Lucia plus a hotel plus they are building a chocolate making factory there, increasing employment, in quite a poor island. Good stuff. But I really wanted to mention Cocoa Loco which also produces lovely chocolate (haven’t tested their drinking chocolate) and are very local in West Grinstead. They say they are the only chocolate producing company that uses all fairtrade chocolate…..perhaps that could be investigated??? I appreciate your blog, always so interesting. We do Twinings. Surprisingly good hot chocolate. But these certainly look worth a try. I love hot chocolate but it seems like I’ve not even touched the surface on trying some of the makes out there. Love the sound of the GU one. I have never tried any hot chocolate – which is surprising as I love chocolate. I would love to try the one with salted caramel added to it. Have you tried Twinings Swiss Hot Chocolate, it’s a firm favourite in our home.